The hive has a exit tube to get outside. The plastic covered box on the side has an entrance feeder and a spot for the bees to get pollen substitute. All the frames have to be drawn out, so there is some work for the bees to do. The hive can be taken outside to remove bees. Most observation hives get overpopulated with bees. Removing a frame of brood is the easiest way to keep the numbers down before they hatch. 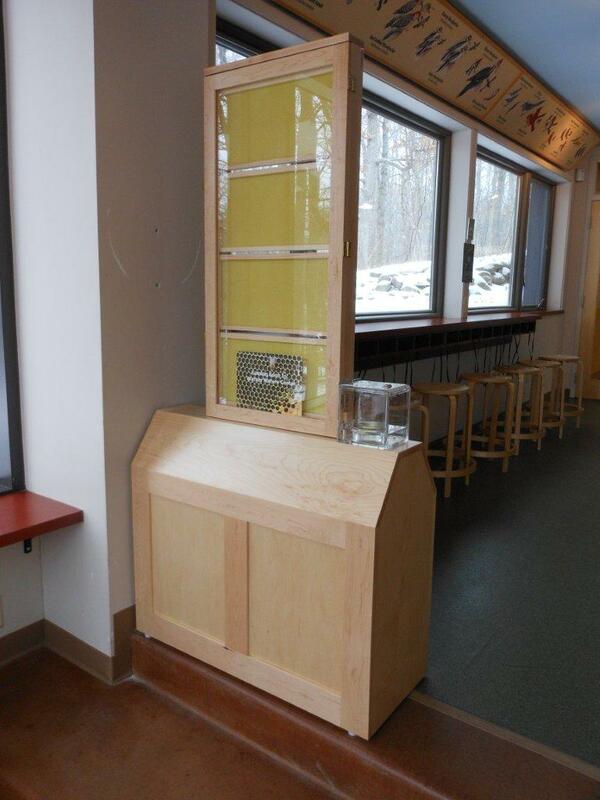 Visitors to the nature center are in for a treat with this very nice observation hive. Paul will populate the hive in late April. I talked to my package bee supplier today and he gave me the dates for April delivery. The tentative delivery dates for package bees will be April 14th for first load and April 21st for the second load. Remember this is farming and weather can influence the schedule. If anyone has ordered bees and has a conflict with their schedule get a hold of me now, so I can shuffle you to a more desirable load. I had a new beekeeper stop by today. He ordered some bees and was showing my wife Wendy a used frame that he got with some used equipment. She put the frame under a black light and saw some foulbrood scale. She called me outside to confirm her suspicions. I looked at the frame outside in sunlight and inside with the black light and in both cases I could see the scale at the bottom of the cells of the frame. There also was foulbrood odor we smelled and I am on day four of a head cold. The frame wasn't solid foulbrood but a few cells had it. 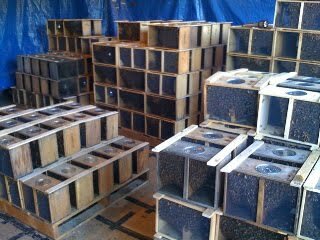 I told the new beekeeper that it was good he checked the used equipment because the new hive would have come down with American Foulbrood disease from the scale in the cells. Foulbrood scale is contagious for a very long time. Frames from the Univ of MN with foulbrood scale on them over 100 years old were tested to see if they were contagious. They discovered they still had active infectious spores in the scale that infected their test colony. If a beekeepers hive dies every year and population always is very poor, American foulbrood may be the reason. Using a black light ( Amazon.com about $12.00 ) makes foulbrood scale take on a greenish color. It is always on the bottom of the cell. The frame has to be positioned so the eye is looking from the top bar side of the frame looking down at the bottom of the cells. Healthy comb looks normal under the light. Don't get confused with pollen in a cell. Pollen is packed into the cell and fills up the cell. Again, foulbrood scale is ALWAYS on the bottom of a cell. Any frames with foulbrood scale should be burned. They will ALWAYS reinfect a colony if they are not eliminated from the colony. This was from a previous year but the same result rings true. Feb is the time of year of starvation. 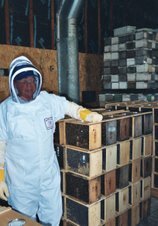 Quick checks can be done for evaluation of honey stores. The lifting of the cover for visual look takes 15 seconds. Lifting the top box for a weight check takes another 15 seconds with very little colony disturbance. If a colony is light on food there is a plan B for saving the colony. Plan B should only be enacted if the bees are going to starve. If there is very little, to no food in the colony. Don't do this if there is frames of honey in the colony. You can be a pal and move a full frame of honey next to the cluster. This again takes about 15 seconds. Feeding syrup can stimulate brood rearing, it can be a little self defeating but if the colony is on the edge and about ready to croak, emergency feeding it is. My favorite it to take an empty drawn comb frame. Get a spray bottle and spray sugar water into the cells of the frame. This is a bit messy and will promptly lead to divorce if done in the kitchen. But by spraying the frame repeatedly with the sprayer it will fill the frame to the top of the cells with syrup. The frame will be noticeably heavier . I try to make a heavier syrup than 1:1 but not as heavy as 2:1. The sprayer may not be able to push the thicker syrup. The full frame should be placed next to the cluster of bees. If the deep frame is full, there should be enough food for 10 - 14 days. If you want, two frames would really keep the colony going. When we start getting to the end of Feb and the temperatures are moderating a bit, we can throw on a feeder. Mid - March the pollen patties go on.